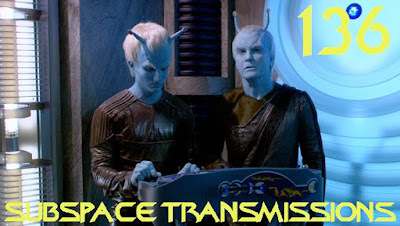 Subspace Transmissions: A Star Trek Podcast: #136 - ALL ABOUT THE ANDORIANS! A few episodes ago we debated whether or not the Tellarites are the franchise's most unfairly ignored alien species. But what about their iconic blue uneasy allies the Andorians? While better represented, has Trek properly served this fascinating race, or is there more left to explore? This week hosts Cam Smith and Tyler Orton wiggle their antennae in support as they take a deep dive into Andorian lore, from their first appearance in Journey to Babel, all the way through the many appearances of fan favorite Shran on Enterprise. The duo also try to predict the future of these militaristic ice-dwellers on Discovery, and ponder whether Jeffrey Combs' badass Imperial Guard is destined to become a legacy character ala Spock or Sarek. Wanna appear on the show? Shoot us a 30 to 60-second audio clip telling us your thoughts on ANDORIANS and you could take the spotlight in an upcoming program! You can also send any other questions, topic ideas or feedback to subspacetransmissionspod@gmail.com! Join us next week as we order the first officers from best to worst!